Urge Your Senators to Oppose S. 7! Click here and Take Action to urge your Senators to OPPOSE S. 7, which would encourage gun confiscation orders around the country. In this day and age, there are few capital crimes in America for which you’re likely to ever be executed. In Ferndale, Maryland, 60-year-old Gary Willis was summarily executed by police with a Gun Confiscation Order, when he came to the door at 5:17 a.m. with a gun in his hand. It now turns out that the Gun Confiscation Order was obtained by a vengeful relative who wanted to punish Willis for his political views. In Seattle, Washington, an early report by Fox News showed that Gun Confiscation Orders were being summarily approved in almost every case. In Middlebury, Vermont, prosecutors obtained a Gun Confiscation Order against a kid — and then, without any statutory authority, used it to strip his law-abiding uncle of his constitutional rights. All of this shows that, when the government has begun to slide toward authoritarianism, it’s really a little too late to expect “the rule of law” to be followed. Currently, Senate Judiciary Chairman Lindsey Graham has said that he’s working with anti-gun zealot Sen. Richard Blumenthal (D-CT) to craft a Gun Confiscation proposal. 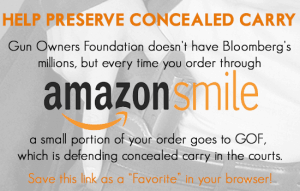 Under the Blumenthal-Graham proposal, states would presumably be bribed to enact statutes which allow police or an angry “ex” to convene “secret courts” to strip gun owners of their Second, Fourth, Fifth, and Fourteenth Amendment rights. 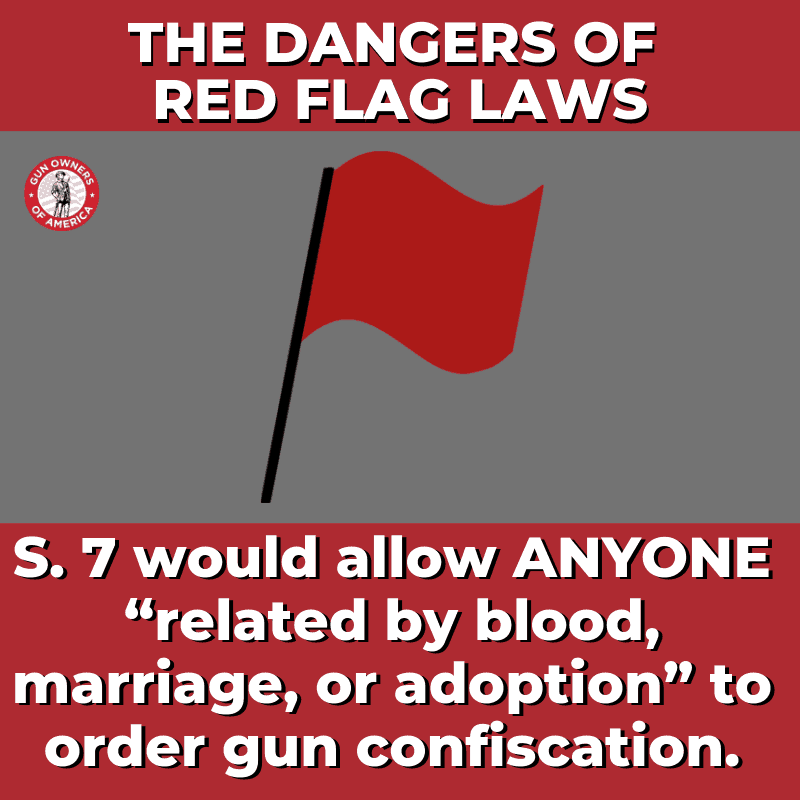 S. 7 is currently the only “red flag” confiscation bill to be introduced in Congress. And it is extreme. To begin with, who can convene a “secret court” where neither the targeted gun owner nor his attorney is allowed to appear? Under S. 7, ANYONE “related by blood, marriage, or adoption.” To be clear, Elizabeth Warren is distantly related to Indians (1/1024th). And all of them would be able to convene a “secret court” under S. 7. The secret court “hearing” is so perfunctory it can be conducted by telephone. And, although the bill contradicts itself, it’s far from clear that written testimony must be under oath. In S. 7, the court is mandated to give a “clear statement of instruction” as to what they can or can’t do. The search and seizure is supposed to occur “upon issuance of the order.” And police are specifically allowed to use “any lawful authority” to search your house and seize your guns. Finally, in every Gun Confiscation Bill that we’ve seen, your “due process” consists of your “right” to spend $10-20,000 to hire a lawyer and expert witnesses and convince a judge he made a mistake. THAT IS NEVER SUCCESSFUL. In a gun control movement which is increasingly willing to shred the whole Bill of Rights if it will eliminate gun ownership, Gun Confiscation Orders are the “crown jewel” of repression. So again, please urge your Senators to OPPOSE S. 7, a bill that would encourage gun confiscation orders around the country. P.S. Please email your Senators and urge them to OPPOSE S. 7 and to OPPOSE Gun Confiscation Orders. And if you’ve let your membership lapse, make sure to renew your membership in Gun Owners of America today for only $20! Stop gun control in New Mexico!